I am completely and ridiculously surprised that this truly amazing mo has taken so long to emerge this month. Who could forget such an obviously insane peice of facewear? Not I. Putting aside my complete dislike of Surrealism and most people involved with it, I can't help but be impressed by the mo. Simple. Stupid. Unfeasibly difficult to maintain. An appropriate perch for small monkeys. How could this possibly go wrong?? A lot of Dali's work stemmed from his impotence and I can't help but think that a moustache constantly sticking straight up is no different. 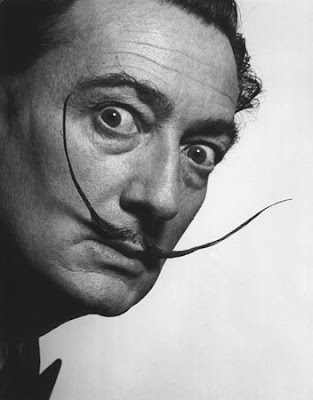 I was all like, "Dali was impotent?!" but then I was all like, "Oh yeah, he had a floppy clock!"